Khishtovani shared the results of the policy paper “Georgia as a Transit Hub and its Increasing Potential in the Implementation of the Belt and Road Initiative” at the forum. “It was very interesting and fruitful to exchange perspectives of the BRI with my colleagues from Tajikistan, Kyrgyz republic, Uzbekistan and Kazakhstan regarding the benefits and challenges of Belt and Road Initiative (BRI) to the Central Asia and Caucasus (CASC) region,” said Khishtovani. Aleksishvili participated in the session entitled “IMF and World Bank Views,” where senior representatives from the Swiss National Bank, the World Bank, the IMF, the Japan International Cooperation Agency (JICA), the Federal Department of Finance of Switzerland, and the Academy of Sciences of Tajikistan discussed the impact of the BRI on the CASC region, from the perspectives of the IMF and the WB. “The roles of multilateral and bilateral development institutions remain very important in the CASC region, especially in terms of governance and public sector reform. The Belt and Road Initiative is not a project only about a transport corridor, but is rather a concept of regional cooperation, economic integration and development. 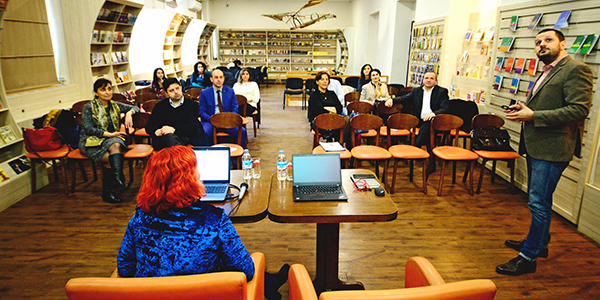 Good governance and efficient operations of public institutions are the key elements of regional development, in which international development agencies should play a crucial role through policy advising and capacity development,” said Mr. Aleksishvili. The Emerging Markets Forum (EMF) is a unique platform, which brings together high-level professionals from all over the world to discuss the key economic, financial and social issues facing countries in transition. The forum is focused on facilitating knowledge-sharing, policy debate and private-sector engagement in order to reach common goals of sustainable development. The forum was intended to enable an exchange of views of participants about how these countries, both individually and through regional cooperative efforts, can maximize the benefits of the BRI and manage any of its potential risks.